No worries. If you forgot your MockFlow account password then you can reset the password at the login screen. In the Login dialog, fill the email field and click on 'Forgot Password?' button. This will send you an email with instructions to create a new password for your account. Note: if email is not received, check in spam / junk folder or your email client filters. I forgot the email address used for my MockFlow account ? 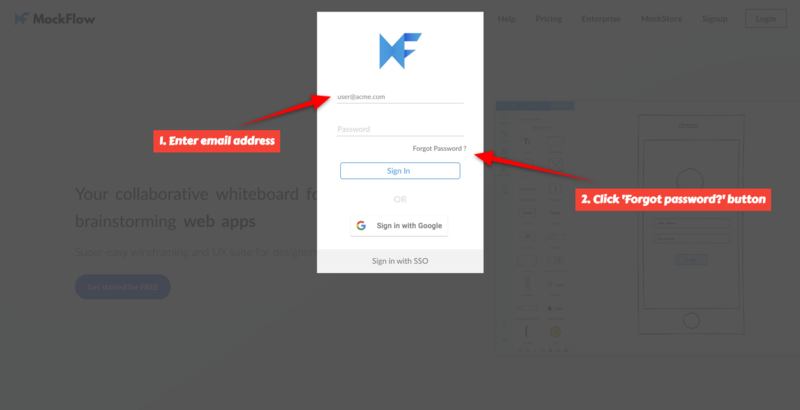 If you don't remember the email address used for signing up your MockFlow account, then try resetting the password with all your emails at login dialog. Or contact MockFlow support mockflow@produle.com for assistance.